NOTE: This is an ever-popular dish that warms the heart and the soul. 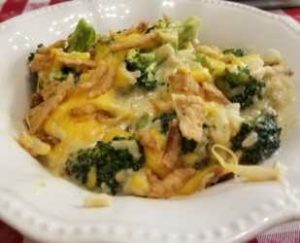 Creamy and hearty with chunks of broccoli lathered in cheese sauce; so good! Preheat oven to 350-degrees. In large skillet or electric skillet, melt butter. Add broccoli florets, onion, celery, and salt and pepper. Stir fry until celery and onion are translucent and broccoli is tender, but not mushy, about 6 to 8 minutes. Combine chicken soup and milk in a bowl until well blended and stir into broccoli mixture. Add the sour cream and the Velveeta cheese. Stir together until the cheese has melted into the mixture. Add the chicken stock and stir over low heat until creamy. Add the rice and stir in well. If mixture feels too thick, add the remainder chicken stock. Let simmer together about 5 to 7 minutes. Pour the broccoli mixture into a buttered 13-9-inch casserole dish. Sprinkle shredded cheese over the top; scatter the fried onion rings over the cheese. Bake casserole for 15 minutes, or until cheese has melted and casserole is set. Serves 4 to 6.